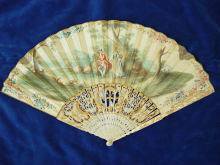 Antique fan, dated about 1780. Fine painted and gilt fan, a young couple in a landscape surrounded by girls and boys with flowers and pigeons. 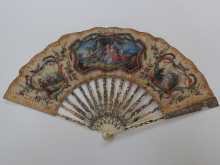 The painted and gilt fan has fine embroidery with sequins. Carved and gilt ox-bone. Height ca 27,5 cm (10.8"), width of the open fan ca. 50 cm (19.7"). The fan is in good condition for the high age, with stronger age wear, partly worn and with small tears, with missing and reglued parts, the ox bone is in good condition, the painting is in very good condition, partly slightly rubbed, the colours are still beautiful. 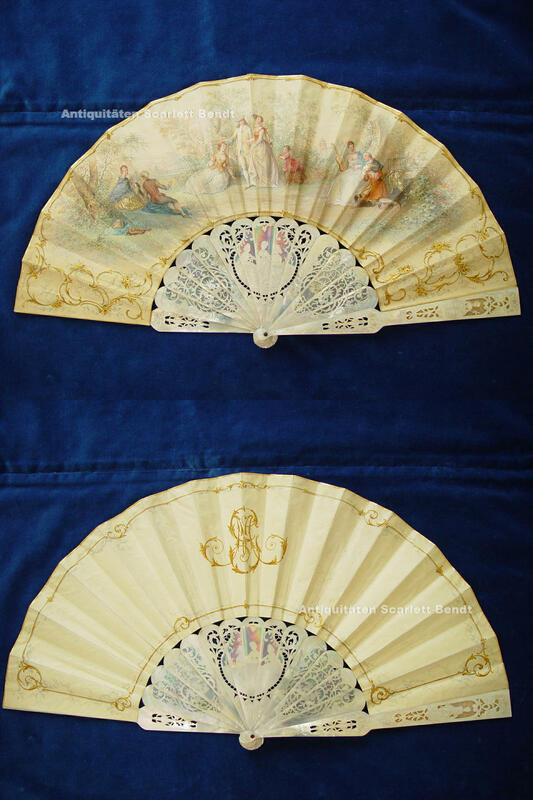 This is a splendid antique fan, of course you must handle this fragile fan carefully, especially when you open and close this fine carved fan. Antique powder tin, dated about 1880-1900. Solid silver with original mirror. Powder tin with hallmarks and silversmith monogram JB. 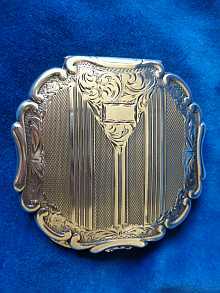 Antique silver with fine engraving. Weight ca. 116 grams. Size of the powder tin: length ca. 8.4 cm (3.3"), width ca. 8.2 cm (3.2"). In very good condition for age, only with tiny traces of age and use. No repairs, mirror without cracks. Antique Baroque Supraporte, 18th century. 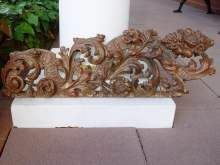 Carved wood, old gilded. With splendid blooms, graips and leaves. This is a splendid Baroque Supraporte (fragment) of the 18th century. In good condition for age, with traces of use. The wood is in good solid condition (not fragile), no woodworm. Supraporte with patina, some old cracks, gilding is rubbed, normal for age. Antique vase, Art Nouveau, made about 1900. Landscape with mountains, beautiful colours. Vase with green number 20, under the glaze annother number, I guess 534. Height ca. 25,5 cm. Diametre of the base ca. 8,5 cm. According to age in good condition, few traces of use. I can see no damages. 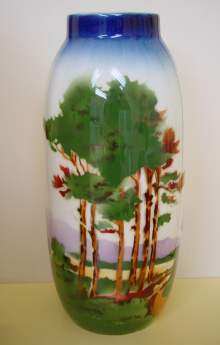 Vase without restorations, no glued parts. Fine upholstery with fine ornaments, hand-polished furniture. 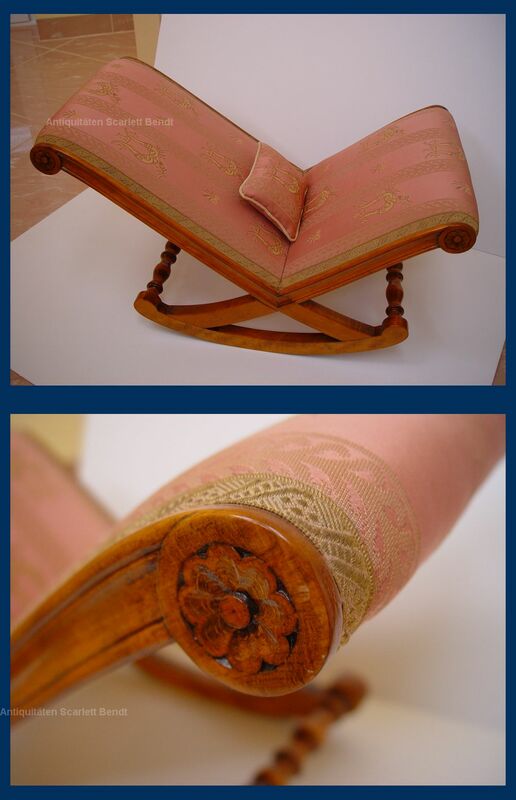 Furniture with antique golden brodery from France. Height ca. : 36 cm. Width ca. : 31 cm. 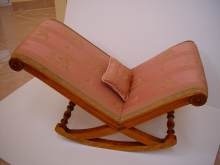 In view of the high age the furniture is in very good condition, only minor traces of age and use. In clean condition, without stains, without odors. The wood is in excellent, solid condition, no woodworm. Antique bronze, made about 1900, signed Moreau. Made by Mathurin Moreau 1822-1912? 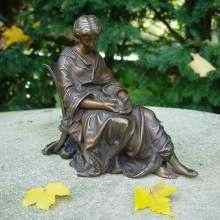 A beautiful young woman sitting on a chair, a dove in her hands. Probably the dove is a symbol for a lost love. This is a very fine and expressive antique bronze. Length ca. 22,5 cm. Height ca. 20 cm. Weight ca. 2,4 kg. In view of the high age the antique bronze is in good condition, with traces of age. There is an old restoration on the backside of the bronze, hardly to be seen. I guess that the bronze was standing on a plinth long time ago. Antique glass with fine landscape and monk, 19th century.
. I guess that verso has also been a landscape, but it doesn't exist anymore. 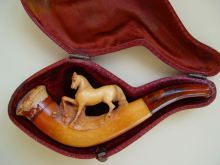 ANTIQUE PIPE, 19.TH CENTURY, ANTIQUE ETUI, HORSE. Antique pipe, 19th century. Carved, fine horse. 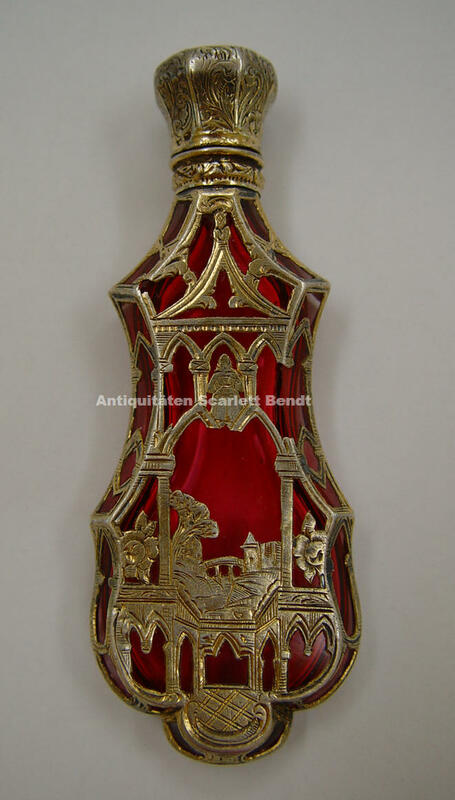 With antique etui, probably its original etui. Length of the pipe ca. : 10 cm. Length of the etui ca. : 12 cm. Good condition, traces of age and use, pipe with two hairlines, horse in good condition. Young lovers in a landscape with their dogs and music instruments, c1860. Verso monogram. Original handpainted, watercoloured, good quality. 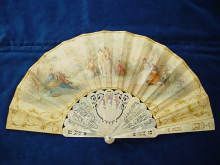 Splendid antique fan with precious mother-of-pearl sticks. Height ca. : 28 cm. Width when fan is open ca. : 53 cm. 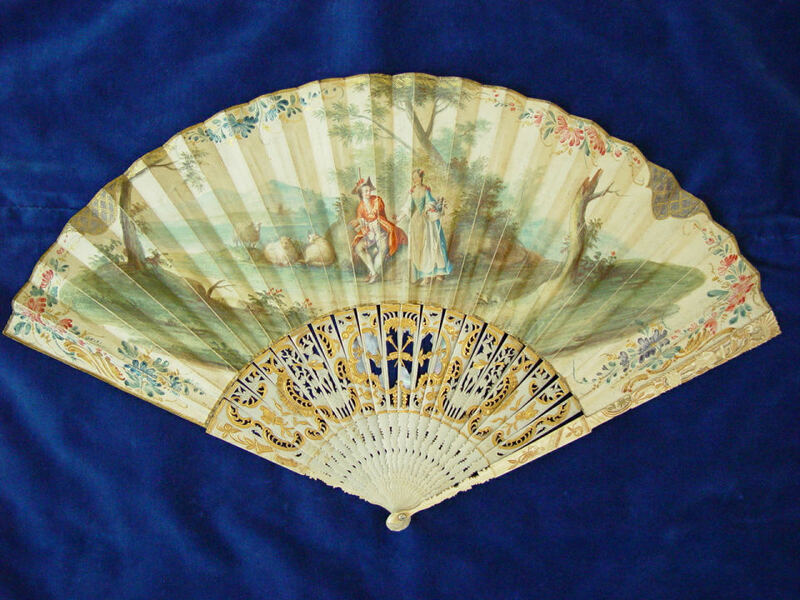 In view of the high age the antique fan is in good condition, with traces of age and use. Few minor cracks, partly traces of glue. The antique painting is in good condition. Antique fan with all sticks. Original antique painting on paper, silver-plated and gilded. Beautiful painting on both sides of the fan, the faces are painted on small ox bone discs, the clothes are made of silk. 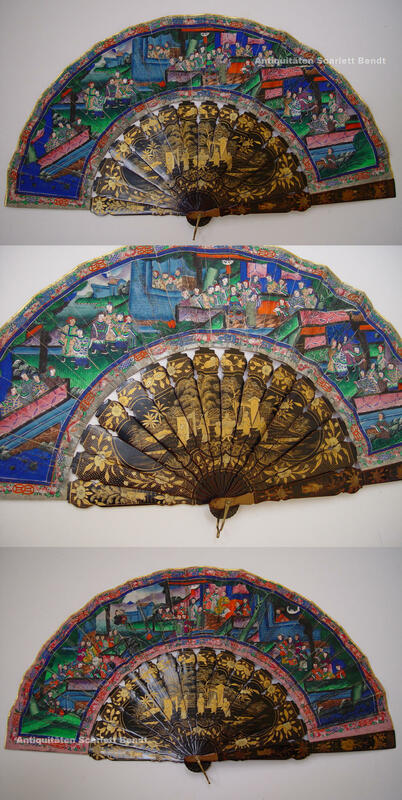 The fan shows the so-called "1000 faces", a lot of figures in a landscape with pavilions and terraces, young women and men with precious clothes. With splendid border of fine Asian ornaments. Size of the opened fan ca. : 53 cm. Height of the closed fan ca. : 29 cm. In view of the high age the fan is in good condition, with traces of age and use. The sticks are in very good condition, no restorations, no broken or missing parts. The old paper partly with visible traces of use, minor colour loss here and there, traces of glue, please notice paper with some old restorations. ANTIQUE FAN, FRANCE CA. 1750, IVORY, GILDING. Antique fan, made of ivory and bone. Carved, with gilding. Musicians, butterflies, flowers and musical instruments. Original painting on paper, two lovers in a landscape with sheep, painted and gilt garlands of blooms. Verso original, plain painting, an angler under a tree. Good condition, minor traces of use.